There is an added bonus for those who decide to buy Resident Evil 6 for PC. 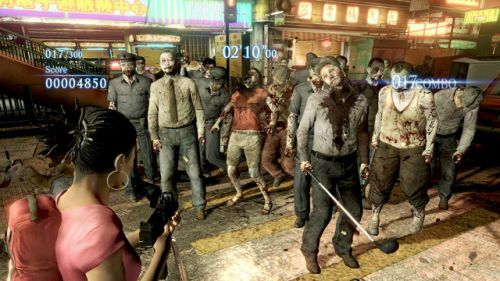 One of the modes in Resident Evil 6, Mercenaries Mode, is receiving a little star treatment from Left 4 Dead. In a special mode within Resident Evil 6 on PC, you can play as the cast of Left 4 Dead as playable characters. The characters you will be able to use are Coach, Nick, Ellis, and Rochelle. In addition to these extra players, zombie hordes will be increased to match the intensity and ferocity of those you would normally find in Left 4 Dead. Finally, some new undead faces will appear in the special crossup, notably the Witch and the Mini-Tank of Left 4 Dead fame. Resident Evil 6 launches for PC today, and is available on Steam for $39.99. The Resident Evil 6 and Left 4 Dead crossover is one of the main extras of the game, and will be arriving on April 5th, free of charge. The PC version of Resident Evil 6 comes with the ability to play online with another player, or through splitscreen. Stay tuned for more impressions on Resident Evil 6 for PC. In the meanwhile, enjoy the trailer. Page created in 0.3960 seconds.